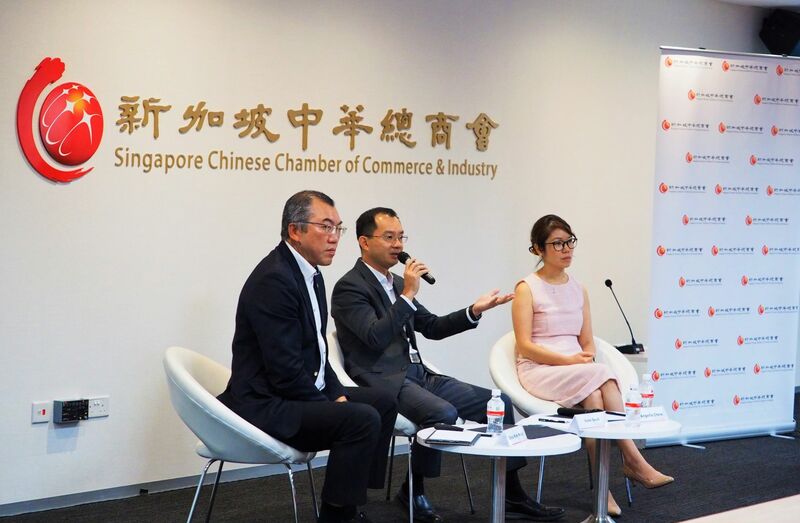 The China-US trade war is not all doom and gloom for Singapore businesses caught in the clash of the two giants, according to two economic experts who spoke recently at an SCCCI-organised event. Mr Irvin Seah and Ms Angelia Chew pointed to the many alternative strategies which Singapore businesses could tap to continue reaping benefits from the two countries as they snub each other. The seeming crisis is also spurring businesses to learn to put their eggs into more baskets, thereby reducing their reliance on either. Furthermore, the dynamics would channel trade to many countries otherwise not prominent players on the trading map, particularly Singapore's close neighbours in Asean. "Looking back 20 years from now, we will likely find this trade war no more than a bleep in history," stressed Mr Seah at the forum titled “Riding Through the China-US Trade War” held on November 21. "There would have been a structural shift in world trade by then,’’ added the executive director for Economics and Currency Research at DBS Bank in Singapore, citing the forecast that Asia’s consumption would be 130 per cent higher by 2030. That Asia over the horizons is emerging especially if businesses are ready to counter what Mr Seah calls “trade dilution” with “trade diversification”. On one side, according to Mr Seah, the US consumers, faced with diluted supply of relatively cheap Chinese goods, need to find substitutes. That means Made-in-Asean products would come to the fore as replacements as many are subject to low tariffs in the US. Meanwhile, more multinational companies, finding China no longer an attractive manufacturing and exporting location, are turning to Asean since they could ship their goods to China and the US from here without facing high tariffs. “The trade war has also the effect of forcing China to further open up its market, and that would benefit foreign companies eyeing a larger space there,” said Mr Seah. With greater trade liberalisation in China and closer co-operation with Chinese companies, including in the service sector, Singapore enterprises would find more exciting opportunities in the world’s second largest economy. In addition, Beijing has stepped up public spending, particularly in infrastructure construction, while more Chinese local companies are looking to venture abroad, including coming to Asean, to find acquisitions – vibrant reactions that run contrary to the bleak economic picture painted by trade war pessimists. Singapore is the most well-positioned to navigate the conflict, said Mr Seah, as we uniquely have a free trade agreement with both China and the US. Besides, Singapore has all the while been a big exporter to China and is the country with the highest FDI in the country – strengths that we can further build on. However, Mr Seah also emphasised that while engaging China, Singapore businesses should also diversify their sources and value chains so that they could maximise their profits in the trade war. “Asean countries, particularly the Philippines, are developing very fast and there are many advantages that we can tap from the FTAs we have with the region and elsewhere,” said Mr Seah. To thrive and be sustainable in this turbulent time means knowing how to identify opportunities, mitigate potential risks, and position one’s business, the economist summed up. Concurring, Ms Chew cited the example of Vietnam quickly setting up a “Made in Vietnam” zone at its border with China to attract FDIs as the latter loses its appeal due to the trade war. She also related her own personal experience of luring a Taiwanese manufacturer to Singapore to invest, whose main export market is Japan, one of our FTA partners. “Asean will be the biggest winner in the trade war,’’ predicted Ms Chew, pointing to the search by US and Chinese companies for alternatives as their countries disengage each other. “If you cannot accept the status quo, map out your suppliers, distributors, manufacturers and key customer locations again,” she advised the 100 or so businessmen who attended the talk. “FTA will be the game changer in the trade war, and by assessing and adjusting to the rulings of the many regional FTAs, you will put yourself in the best position,” said the founder and managing partner of AC Trade Advisory. But Ms Chew also warned against the popular assumption that FTAs generally offer zero tariffs and advised diligence in researching on where to site a manufacturing plant and where to source materials. “Each FTA has its unique rules of origin,” said the trade adviser. Both experts do not expect the trade war to abate soon although there are signs that Washington and Beijing are ready to talk. “The trade war has highlighted Singapore as a new sweet spot with its many FTAs. Make use of them and try to make friends with many countries and regions as possible,” said Ms Chew.